The California state Capitol in Sacramento, where the $US 7.5 billion water bond deal was signed Wednesday evening. Click image to enlarge. Hours before an extended deadline expired, California lawmakers on Wednesday evening passed with overwhelming support a $US 7.5 billion water spending package that allocates money to store, clean, and deliver water as well as restore ecosystems and prepare for a warming world. 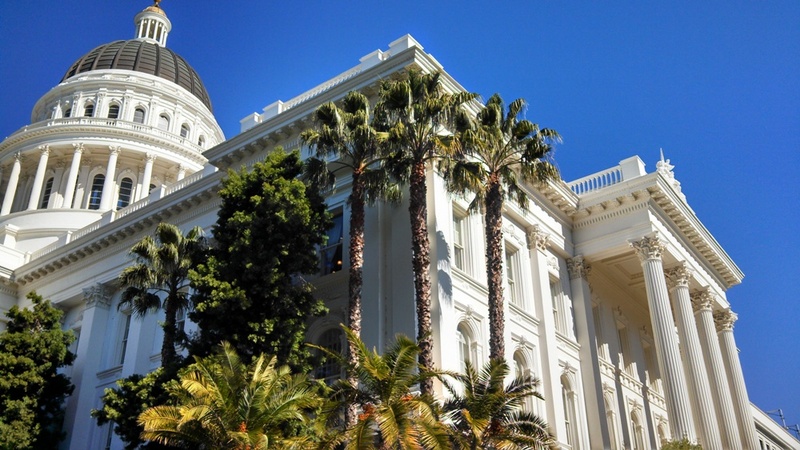 Governor Jerry Brown, who stayed out of negotiations until the last week, promptly signed the bill, thus checking off one of two major pieces of water legislation – the other being groundwater reform – that will be addressed before the legislature adjourns August 31. Destined for the November ballot, the water bond will replace an $US 11.1 billion dollar package that was passed by the legislature in 2009 but never reached the voters for fear of failure. That measure was widely viewed in Sacramento as being too large and too laden with pet projects to garner public approval. Spurred to action by a historic three-year drought that has put the state’s complex water system in the spotlight, Democrats and Republicans in both legislative chambers have great hopes for this version, which passed by a 77 to 2 vote in the Assembly and a 37 to 0 vote in the Senate. “This bond will be successful because we put in the work together,” said Assembly Speaker Toni Atkins. Roughly $US 7.1 billion is new spending; the balance comes from older bond funds being redirected to new purposes. The mood in the Capitol was joyous as the representatives verbally hugged each other in celebrating a bill that was rejected in June and needed a last minute deadline extension on Monday in order to reach the finish line. The bill offered a prize for every region in the hydrologically diverse state. Projects to treat wastewater or provide clean drinking water get $US 520 million. Water recycling projects earned $US 725 million. The bill doles out $US 1.5 billion to repair streams, wetlands, and fish habitat, allocating roughly one-fifth of that amount to 11 regional conservancies. Southern California representatives, concerned about aquifers polluted from a century of industrial contamination, were pleased with the $US 900 million to clean up groundwater basins. Some $US 810 million will be available for projects that regional bodies deem necessary to adapt to climate change or water scarcity. Passage of the bond hung on how much money would be allocated for storage, meaning above ground in new or expanded reservoirs or underground in aquifers. Republicans in the Central Valley, a farming powerhouse, wanted at least $US 3 billion. The version that failed in June offered $US 2.5 billion. A compromise of $US 2.7 billion, more than one-third of the bond spending, was reached this week. Two dams – Temperance Flat on the San Joaquin River and Sites reservoir in an off-stream channel in the Sacramento Valley – are targets for funding that are staunchly opposed by green groups and sure to provoke the most debate of any proposal in the bill. The California Water Commission, a nine member body appointed by the governor, will select which projects receive money. That decision will be based on the “public benefits” – defined as improvements to water quality or the temperature and timing of river flows for fish species; additions to flood control capacity; emergency supplies to respond to a natural disaster or act of terrorism; and a place to swim or boat. Because the construction funds for storage cannot be spent until December 2016, those battles will come later. For now, the Capitol is jubilant. Good to see that California is finally starting to realize the importance of continuous water management. Here in Nevada, our consumptive use of the Colorado River (Acre-Feet) continues to drop, despite increased tourism and population. In Clark County, we capture Valley rainwater with our conveyance system, and have three state-of-the-art waste-water facilities. When California starts desalinization, converts landscapes to xeriscapes (they already have programs that pay $3/sq-ft, far more than SNWA’s $0.75/sq-ft), and farmers see the value in fallowing for water rights, they will get through this current water cycle.